With up to 17 W / mk pads surpass all previously-seen thermal pads and pastes. So now practically all hardware components can be easily and cleanly covered with ice! The "Alphacool Eisschicht" offers all the benefits and features of a typical thermal pads: self-adhesive, elastic, adaptable, and more! It canbe used in many applications: RAM and motherboard coolers or graphics cards and CPU coolers, wherever board meets heatsink you are well advised with the Alphacool Eisschicht. The pads are available in different power levels, 11, 14 and 17W / mk each available in 0.5mm, 1mm and 1.5mm thickness to be able to compensate for differences in height perfectly. 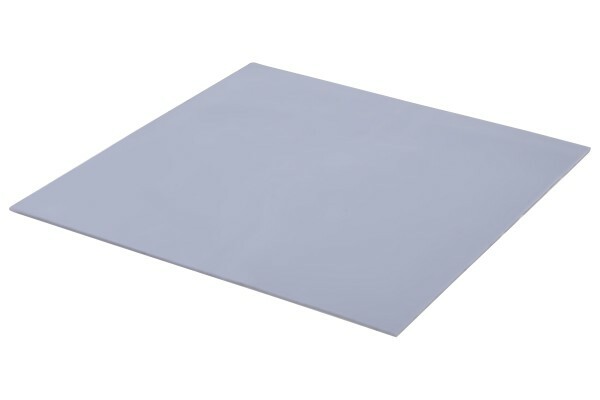 Likewise, any thickness is again available in 100x100mm and 120x20mm (suitable for RAM cooler). These can be easily cut with scissors to separate the right size for each component to be individually configured.